The neighborhoods of northeast Seattle gradually came into the city limits between 1941 and 1954. The Seattle City Limits did not advance northward in a straight line, like water rising in a bathtub. It was up to each voting precinct in northeast Seattle to petition for annexation into the city and then vote in favor at a special election. Finally as of 1954 the present north City Limits were set at 145th Street. In 1910 the city limits of north Seattle went across 85th Street from Puget Sound past Green Lake, as far east as 20th Ave NE. Then the boundary line took a “jog” down to NE 65th Street. All of what is now View Ridge, Wedgwood, Meadowbrook and Lake City remained outside the city limits until the 1940s and 1950s. The word “annexation” means the process of bringing more areas into the city limits. In northeast Seattle there was a long struggle, spanning from 1941 to 1954, before all of these areas were annexed and the city limit was extended to NE 145th Street where it remains today. When some districts of northeast Seattle voted themselves in, they became almost like islands surrounded by areas which were still not in the city limits. An example was the Ziria Precinct, a five-square-block area around what is now the Northeast Branch Library. Enough signatures in favor of annexation were gathered and presented to the city on October 21, 1942, to justify calling an election. At the election of January 5, 1943, a majority of the Ziria votes cast were in favor of annexation. The Seattle City Council then approved an ordinance of annexation, with an effective date of March 12, 1943. Ziria is shown on the Seattle Annexation List as Map Area 22. 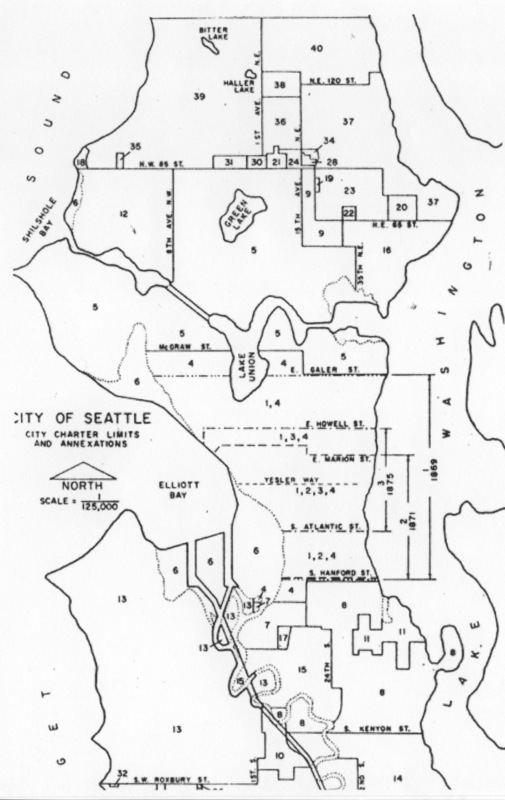 The Seattle Municipal Archives has a Seattle Annexation Map and the List by Dates; the map and the list of information is also posted at the end of this article. After Ziria (the blocks around around NE 68th Street) in 1943, it would be another two years before Wedgwood south of NE 85th Street was annexed (Map Area 23) and not until 1953 did Wedgwood north of NE 85th Street come in (Map Area 37). Throughout the 1940s separate voter precincts either voted themselves in, or continued to resist the change into the early 1950s. As of 1910 the only areas of northeast Seattle which were within the city limits were Laurelhurst and parts of Ravenna. The city limit, starting at Puget Sound and travelling eastward, was at 85th Street so that the communities of Ballard, Fremont, Wallingford, Green Lake and the University District were included. East of 20th Ave NE the city limit was at NE 65th Street, and it remained so until the 1940s. Seattle historians have speculated as to why northeast Seattle got “left out” of the city limits for so long. One reason can be seen from a map of north Seattle, that earlier communities were all formed on and around water. One of the earliest Seattle neighborhoods, Fremont, is located at the northwest corner of Lake Union with easy access to and from downtown. In the 1880s, long before the existence of the Lake Washington Ship Canal, enterprising Fremont residents enlarged and utilized a stream called The Outlet in order to float logs onward towards sawmills in Ballard, and then out to be collected by ships on Puget Sound. Green Lake, a body of water not used for utilitarian purposes like logging, was an attractive place to live and its geographical position made for easy access. In the 1890s Green Lake was already a well-developed residential neighborhood with a streetcar line connecting through Fremont and on to downtown Seattle. Except for the shores of Lake Washington, northeast Seattle lacked access to navigable bodies of water and as an “inland” area, was the last north Seattle area to be settled. The areas of northeast Seattle beyond NE 65th Street, including what would become Wedgwood, were semi-rural and didn’t get electricity until 1923 – provided by Puget Power, not City Light. Because of the lack of utilities and services, land was cheaper in Wedgwood and many families chose to live there so that they could own several lots, have a garden and keep chickens. House sites were chosen according to the availability of water, as each house had to have its own well. 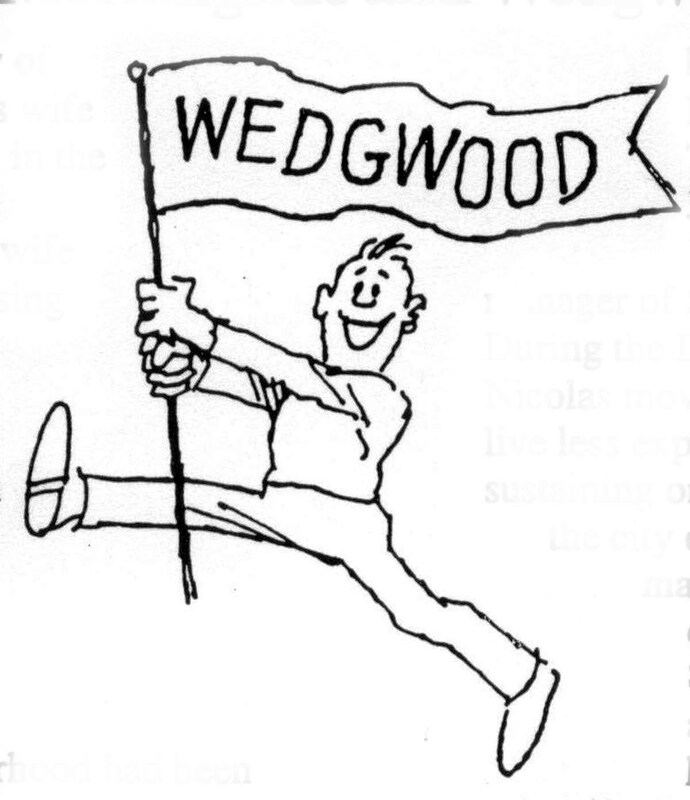 By the 1930s water and electric lines had been put in but Wedgwood was still characterized by families who were trying to live cheaply by having a semi-rural lifestyle. During the economic depression years of the 1930s, it was frowned-upon for a married woman to work outside the home. Many men were unemployed and it was felt that job preference should be given to men who were heads of households and needed to support their families. For this reason, in the 1930s it was even more important to live as economically as possible and get along on one income. Women were expected to help by cooking at home and doing many other things to save money, such as cultivating a garden for food for the family. The economic depression of the 1930s was not quite over when the USA was catapulted into war by the attack on Pearl Harbor on December 7, 1941. The war caused a sudden jump in the population of northeast Seattle as war workers came to live in and around Sand Point Naval Air Station. Some people found housing in northeast Seattle because it was a cheaper area to live in, and they went to work at Boeing Aircraft and many other wartime industries. Northeast Seattle was a “car” neighborhood where people drove to work, sometimes commuting long distances in an era before the I-5 freeway. As of the outbreak of the war at the end of 1941, all new housing in Seattle was allocated to war workers. Some developers, such as Albert Balch who had already started building houses in a development called Wedgwood, were given some exceptions to wartime restrictions on materials so that they could continue building. The economy finally got moving, with so many jobs available that women were actually encouraged and recruited to take the places in factories which had been vacated by the men who had gone to war. Developers and realtors were among the first to understand the advantages of annexation of northeast Seattle. For a developer, having the City put in utilities such as water lines would be a big savings, as they would otherwise have to pay for it themselves. Real estate agents understood that with all city services such as electricity, water and sewer, properties would increase in value. Frank Vickers Cook, a real estate man who lived in Wedgwood, led the charge by getting signatures on a petition to bring annexation to ballot. But some people seemed overwhelmed by the number of changes that took place in society during the war years of the 1940s, including the population increase and the modernization of Wedgwood, and they howled with resistance at having their neighborhood become part of Seattle. In November 1953 the King County Commissioners received the annexation ordinance and set the new Seattle City Limits at 145th Street, from Puget Sound to Lake Washington, effective in January 1954. One of the leaders of the anti-annexation movement was Dr. Judson O. Ball, a retired dentist. After living for twenty years in the University District, which was inside the city limits, in 1930 Dr. Ball moved to a new house at 7502 20th Ave NE. The house had water and electricity but was outside the Seattle City Limits, and apparently Dr. Ball thought it would always be that way. Dr. Ball became active in the community. In 1940, representing the Hayes Park-Ravenna Community Club, Dr. Ball testified in the Northeast Transportation Company bus lawsuit case, Dr. Ball’s testimony in support of the complaint filed by the Maple Leaf Improvement Club was that the bus service was unsatisfactory. Dr. Ball did not seem to see the connection, however, of the way to get better services for northeast Seattle by bringing the area within the city limits. Dr. Ball became the leader of the anti-annexation movement and he was still fighting even after the entire area from NE 65th to 85th Streets had voted to be annexed. At a judicial hearing before the City Council vote on January 4, 1945, Dr. Ball, age 84, protested that the annexation election of December 1944 was illegal. After City Council did vote that day in January 1945 to accept the election results and annex the area, Dr. Ball contended that he would take the issue to court. What were the objections to the annexation of northeast Seattle? One of the primary reasons why some northeast Seattle property owners objected to annexation was that they thought the city taxes would be excessive. People did not want to be assessed for sewers and street improvements. Some businessmen of Seattle thought that taxes would fall most heavily on them to help subsidize the thinly-populated northeast, so they were against annexation. An Army veteran wrote to the City of Seattle after the annexation vote to say that it wasn’t fair because he had just returned and did not get to vote against annexation. Some people wanted to live with as little “interference” as possible, including taxes, as they mistrusted the city government. One of Dr. Ball’s complaints to City Council was of construction of inadequate sewer systems. He thought the City services were either incompetent or corrupt and unlikely to do a good job. At the time of the City Council hearing on January 4, 1945, World War Two was still going on in Europe. No one knew exactly when it would end, and some people at the City Council hearing protested that no major changes like annexation should be undertaken “until the boys come home from war.” It was the contention of some that everything should be kept exactly the same until then. Concluding sentence of the Army veteran’s letter, saying that he would be glad to do anything to block the annexation. His letter was written two weeks after the vote had already been taken. Seattle Municipal Archives CF #183214, a collection of annexation material. From our perspective today, we can understand the distress caused by rapid social changes and the upheaval of war in the 1940s, but we see that it was not realistic for people to expect that everything could or would be made to stay the same. One of the biggest adjustments for war veterans of every era is that indeed, while they are away, the processes of change continue and the world they knew at home, is not going to be exactly the same when they return. One of the best movies on this topic is The Best Years of Our Lives, which tells of three World War Two veterans and the adjustments made by them and by their families when the veterans returned home. Flyer distributed by northeast Seattle residents who were opposed to annexation, alleging that the City regulations would be too restrictive and there would be harmful tax consequences. This flyer is from the collections of the Seattle Municipal Archives, CF 183214, a large collection of petitions and letters of protest against annexation of northeast Seattle. Into the 1940s many northeast Seattle residents still lived a semi-rural lifestyle. Some people kept chickens and a few still kept one or more cows. One Wedgwood resident, Charlie Schultz, was killed by a bull in August 1942, showing that at least some of the neighborhood was still very rural. The pasture where Mr. Schultz was killed had been bought by the Seattle School District for the future Nathan Eckstein Junior High School, but the school was not built until the site came within the city limits. The home of the Army veteran who wrote a letter protesting annexation, was at 7519 45th Ave NE. The house, built in 1927, was in a semi-rural area of northeast Seattle where houses had a lot of space around them. Many people kept chickens and had large gardens. During the annexation controversy, some Wedgwood residents squawked loudly about the City of Seattle regulations against the keeping of chickens and cows. The anti-annexation group circulated petitions warning that, if the Wedgwood area came into the city, no chickens, rabbits, cows, and horses would be allowed, and building code regulations would be enforced (see the copy of the protest flyer, above). The protest flyers and petitions contended that only a small number of people wanted annexation, but this proved not to be true; the annexation vote was in the majority, with the final group of precincts voted in on December 5, 1944. In the 1930s almost everyone in Wedgwood had a garden and grew some of their own produce. During the war years of the 1940s Victory Gardens were even more encouraged as a patriotic effort of Americans to be self-reliant and designate more farm crops to the troops. It came as a shock, then, that even before the war ended the residents of northeast Seattle were having to give up their rural lifestyle to make way for street-widening, sewer lines and smaller city-sized lots. There had been some mom-and-pop stores in the area but no big grocery store came to Wedgwood until the Safeway in 1946. Except for a tavern at each intersection, there were no buildings at the intersections of NE 75th and 85th Streets on 35th Ave NE, until the 1940s. 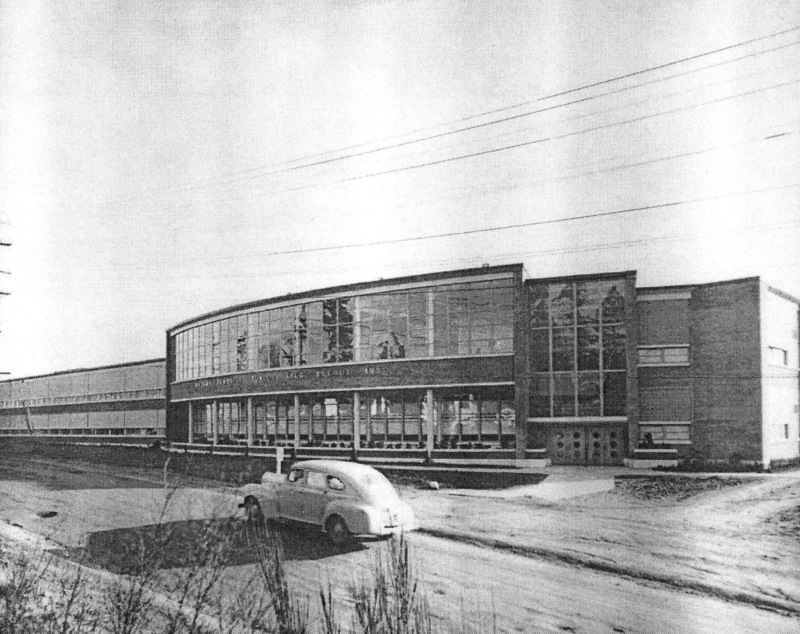 Nathan Eckstein Junior High School was built at 3003 NE 75th Street in 1950. In this 1954 photo, we see that NE 75th Street was still not paved. Photo #19254, courtesy of the Seattle Public Library Historical Collection. Some people objected to annexation because they said that the city wanted to put in “unnecessary streets.” It is true that not all the residential sidestreets had been put through in Wedgwood, and some of the arterials, such as NE 75th Street, were in rough shape and were not paved. But the street grid had always existed (at least on paper) with a plan for arterials at ten-block intervals such as NE 75th and 85th Streets, so in the process of the annexation of northeast Seattle, the street plan was fulfilled. Reference is made to your letter of February 4th in which you ask certain questions relative to why the City Council proposes to accept the areas which recently voted to annex to the City of Seattle. From conversations had with a great number of citizens in these two communities, it is very apparent that they have a real need for sewers. Lack of such facilities creates a menace to the health of everyone living in those neighborhoods and also to the residents within the City Limits. As the natural drainage of these areas is toward the City of Seattle, the only means of obtaining sewers is by annexation, as the State Law provides no practical or economical method by which communities outside incorporated cities can finance such construction. There comes a time in the natural growth of any community where the needs of the majority of its citizens require annexation if the community is to progress further. If you will recall back to about 1907, when Laurelhurst, Ravenna, Ballard, West Seattle and other districts annexed to the City, how undeveloped and sparsely settled these communities were and how great has been their development since and how essential now to the general civic welfare of the City they have become, I am sure you will understand the motives behind the Council’s action. The Council cannot reasonably be asked to consider petitions opposed to annexation filed after an election held in the manner prescribed. Dr. Judson O. Ball’s court challenge to the 1945 phase of annexation was not successful and he died in 1950 at age 89. Others continued to resist the process, but annexation proceeded northward, vote by vote. Finally in 1954, with the addition of Lake City (Map Area 40), annexation of north and northeast Seattle was complete. The north city limits were set and remain today at NE 145th Street, a straight line going east and west across from Puget Sound to Lake Washington. The following is the Annexation Map with numbered areas, followed by the Annexation List by dates. For the purposes of this blog article about northeast Seattle annexations, the list posted here begins with Map Area 19, Hayes Park. For the complete Seattle city list see the Map and List on the Seattle Municipal Archives webpage. Here is an essay on the Seattle Municipal Archives about annexation. See also an article by David B. Williams, Seattle geologist and history writer, on the subject of annexation. Seattle Annexation Map with numbered areas corresponding to the list of dates of annexation (see list.) Courtesy of Seattle Municipal Archives. 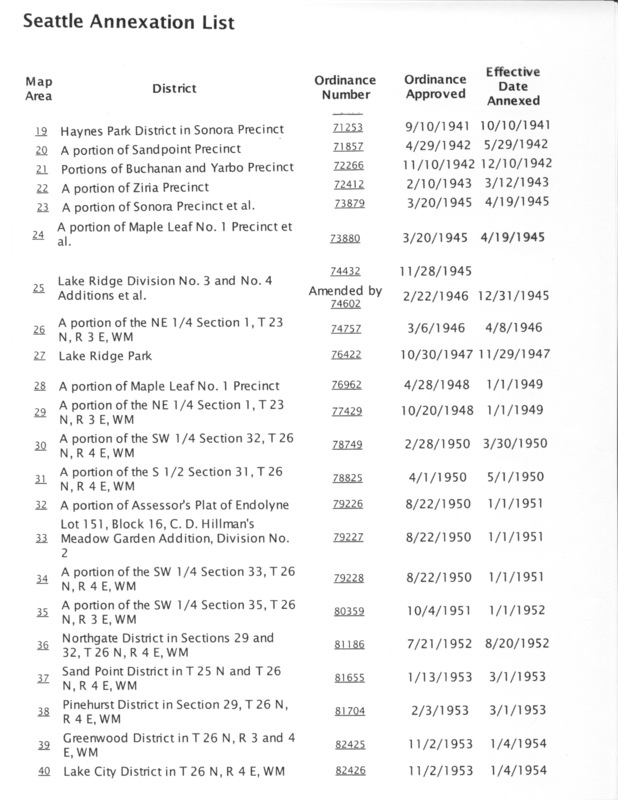 List of northeast Seattle annexations, beginning with Map Area 19, Hayes Park. Courtesy of the Seattle Municipal Archives. This entry was posted in boundaries, Controversies and tagged annexation, rural years in Wedgwood, what are the city limits, what year did the city limits change. Bookmark the permalink.